The Pear’s 100th production is a repertory rotation of two politically charged plays, The Guys, by Anne Nelson (reviewed on A Good Reed Review here), and Veils, by Tom Coash, which is the subject of this review. 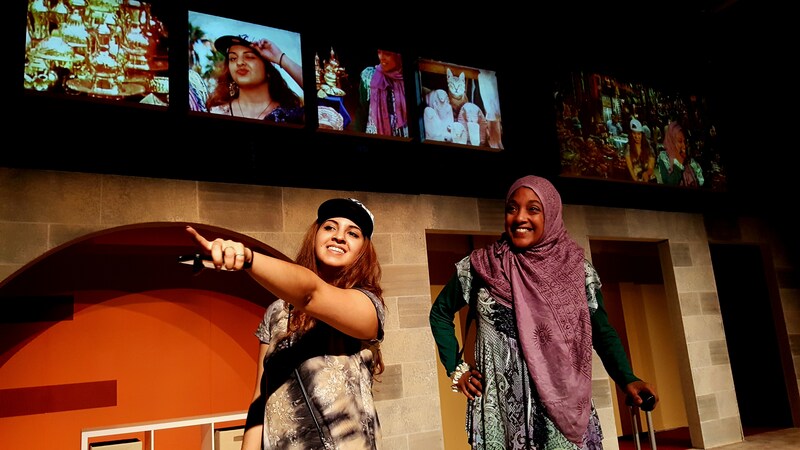 Veils follows two female Muslim students at American Egyptian University (modeled after American University in Cairo) – an American named Intisar (Amani Dorn), and an Egyptian named Samar (Naseem Etemad). Coash has taught playwriting at numerous universities including the American University in Cairo. Drawing from his experience there, he’s compressed several events from the Arab Spring into this story about these two women. Samar is very modern, liberal, and she relishes freedom. She loves her New York Yankees baseball cap, “cool” clothes, and modern pop music. She writes a blog talking about women’s issues, and studies video journalism hoping to one day work for a major international news outlet. Intisar wears a hijab. She has come to Egypt to gain a greater understanding of Islam and to study Arabic. Although the two are entrenched in the faith, they are politically opposite with many preconceived notions about the other’s culture. They each chose the other as a roommate based on culture (Samar requesting an American and Intisar requesting a Muslim), and they are rather surprised by their political divide. Being a visitor, Intisar deals with a bit of culture shock. Samar also ends up with some unexpected culture shock as she is caught up in the events of the societal revolt that is unfolding around them. The two meet at the airport, and so begins their association. The play ebbs and flows, centering around what wearing a veil means, and why some women choose to wear one even when it’s not required of them, while others rail against wearing one at all costs. The real message here is that it’s just as bad to not be able to wear a veil as it is to be forced to wear one. Ron Gasparinetti’s scenic design is simple and functional as it serves both Veils and The Guys. Several arches stand upstage giving the room some depth. There are several film screens that hang above the arches, and in Veils, these are used to display various scenes from Egypt, both before and during the protests. Some of the projections include Dorn and Etemad, while others appear to come from news footage, and in the opening sequence, the departure/arrival flight information along with a picture of the Cairo airport terminal. After the airport sequence opening the show, the set is split in half with stage left forming an American Egyptian University dorm room with two beds and a dresser, and stage right becoming a makeshift film studio with a camera, chair, and computer table. Several Arabic songs are used for scene changes. Some of the set shifts take long enough that it gets a little uncomfortable waiting for them to complete. At key points in the story, the Adhan (Muslim call to prayer) is heard, filling the house with its melancholy message to the faithful. Preshow, the larger screen above stage left displays rotating verses from the Qur’an, mostly dealing with modesty or concealment of beauty. The smaller screens show a veiled woman, and modern Arabic pop music plays over the sound system. At curtain, the music stops, and the screens go dark. Dorn, as Intisar, enters. While proudly standing in a single spotlight center stage gazing straight ahead into an imaginary mirror, she’s reverent as she easily puts on a hijab as though this is something she has done every day for many years. And so begins her journey. Director Vickie Rozell keeps the action moving in a high energy presentation. Dorn and Etemad have great chemistry as university roommates. From the moment their characters first meet in the Cairo airport, they make us feel the walls between their cultures simultaneously strengthening and weakening. Etemad quickly embraces Dorn, kissing her on both cheeks, and showering her with a traditional Egyptian greeting. Their dialog is rapid fire much of the time, and their deliveries are earnest. There’s a fair amount of humor in the script, capitalizing on colloquial language misinterpretation. Both actors master the Arabic sprinkled liberally throughout the discussion. Some of the words are translated as part of the story, others are obvious from context, though most of the dialogue is in English. Veils is poignant, funny, relevant this election season, and very much worth a trip to The Pear this run.